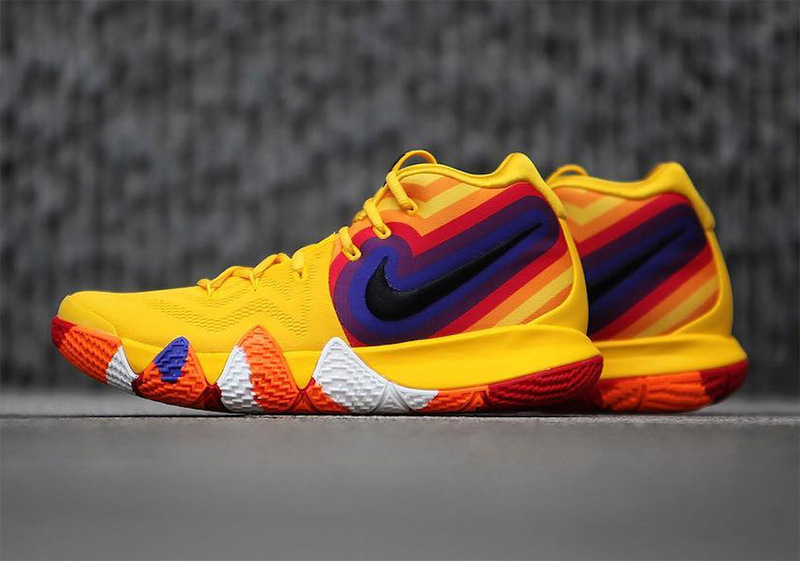 It is clear that Nike and Kyrie Irving have shifted their focus toward nostalgia as far as the Kyrie 4 is concerned. Not only is the sneaker world hotly anticipating the upcoming Cereal Pack – with iterations dedicated to Kix, Cinnamon Toast Crunch and Lucky Charms – but we brought you an official look at another GR version with serious 90s vibes yesterday. Now, we have a first look at another upcoming selection that sticks to this aesthetic boasting a color scheme that takes cues from vintage brand artwork, or even everyone’s favorite ugly Houston Astros jerseys from the 80s and 90s. Red, orange, yellow, purple, and blue are responsible for this sneaker’s bright and bold color scheme with yellow taking up the majority of its real estate. Grab a detailed look at this eye catching Kyrie iteration below and keep it locked for release information as we have it. While you wait, be sure to check out our Sneaker Release Dates page for info on more upcoming Nike Shoes.